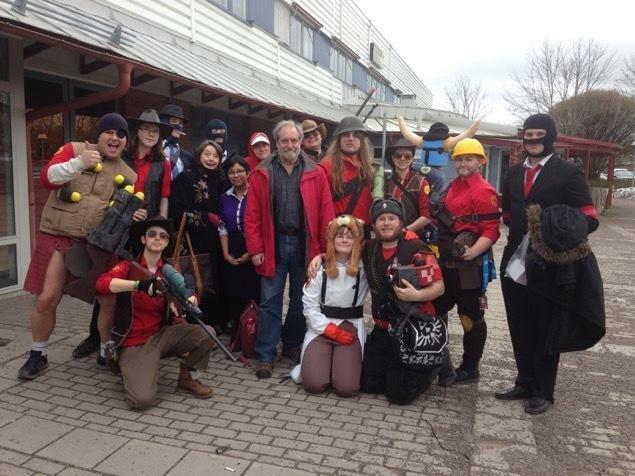 Ellen McLain (standing fourth from left) and John Lowrie (standing in center) are unlikely celebrities in gaming culture. But they are the voices behind some of the video game world's most popular characters. Ellen McLain (center) meets with fans of GlaDOS, the popular character from the Portal and Portal 2 video games which she voices. Ellen McLain had a long career as an opera singer. But now her voice is most famous for something entirely different: video games. McLain is the voice of GLaDOS, the passive-aggressive computer in the games Portal and Portal 2. Her husband, John Patrick Lowrie, also had a successful career in music as a guitar composer. But now, he's famous for doing the voice of the snarky Australian sniper in the game Team Fortress 2. "Professionals have standards," Lowrie's voice declares at the sniper. "Be polite. Be efficient. Have a plan to kill everyone you meet." More than a third of Americans play video games three or more hours a week. And these games are blockbusters. A 20-year-old has a good chance of having played them. Part of the appeal is the richly developed characters in the games. So this is a story of unlikely fame for McLain and Lowrie, now in their early 60s. Lowrie started to land video game roles two decades ago. "The first video game I did was a thing called Spy Fox Breakfast Cereal," he says. Lowrie wasn't a snob about it; it was a gig. But in those days, the industry wasn't that sophisticated. Game developers would just hand him some lines with no direction. One time, his line was simply: "Goodbye, son." "And I said, why am I saying goodbye to him? What's going on," Lowrie says. So they called up the writer, who then let Lowrie know that the fictional son was either going to go down to the store and be right back, or step through a inter-dimensional gateway and go to another universe, never to be seen again. Two starkly different scenarios, and Lowrie was given a difficult task: Read the script in a way that would work for both. "So I said, 'Goodbye, son,' " Lowrie recalls. The developers were impressed. "Great, that's great. That will work fine." Developers got more savvy as the games became more cinematic. Lowrie then urged his wife to audition, but she was reluctant. "I thought, 'Why should I do this? I'd never get work,' " McLain says. "Well, never say never." For the role of GLaDOS, actors who were auditioning were told to sound as much like a computer-generated voice as they possibly could. In Portal, GLaDOS has users do puzzles and keeps promising cake. But by the end, they realize she's lying. McLain must have been really good at sounding mechanical — she got the job. It was then that Lowrie realized just how big that would be. "Twenty-four hours after the game was released, we got a fan email from Denmark saying people are in the streets of Copenhagen chanting, 'The cake is a lie, the cake is a lie,' " he says. "It's like, 'Oh my gosh, I'm married to a world-famous person now.' "
But Lowrie's famous, too. And not just for the Sniper, but also for Pudge the Butcher in the game Dota 2. Podcasters from all over the world do gushing interviews. At one recent meeting with a Indian podcast, the host said he got goosebumps listening to the voice of Pudge in person. Lowrie and McLain now have this link to a younger generation. Sometimes just for fun, they reveal their video game alter egos to random strangers. "I'll see, say, a 17-year-old boy walking down the street, and as I go by I'll say, 'We're a lot alike, you and I. You tested me, I tested you, you killed me, I — oh wait a minute, I guess I haven't killed you yet. Well, food for thought,' " says McLain. "And I totally blow their mind." McLain and Lowrie say they never could have imagined this career. For them, it's surreal. But they say it's gratifying to play the characters so many people around the world love — or love to hate. Copyright 2018 KNKX Public Radio. To see more, visit KNKX Public Radio. More than a third of Americans play video games at least three hours a week. And part of the appeal seems to be the characters. Just like in an animated movie, they are brought to life by voice actors. For one couple we're about to meet, that brought some unexpected fame. 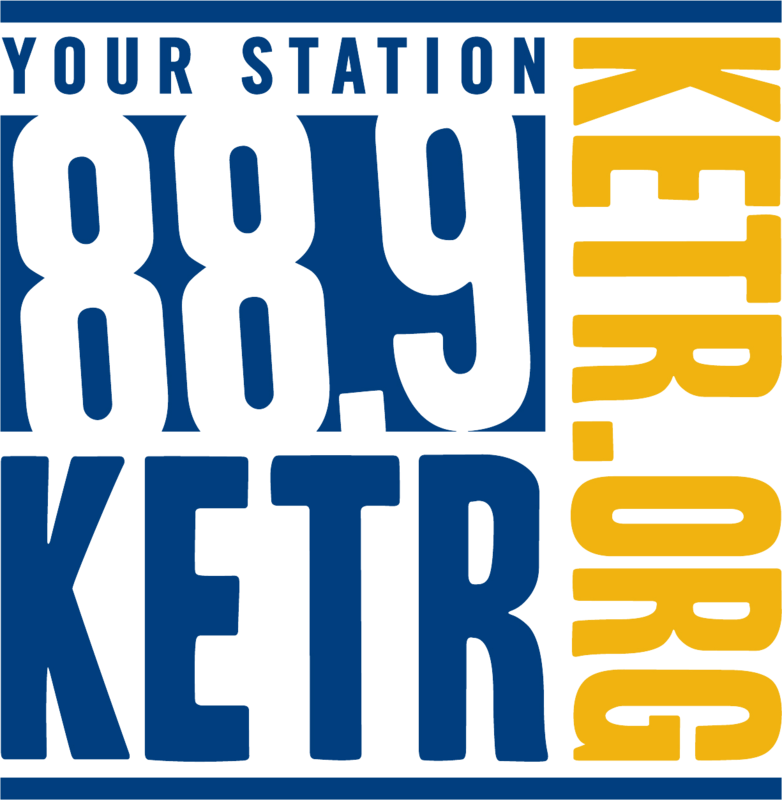 Ashley Gross of member station KPLU in Seattle has their story. ASHLEY GROSS, BYLINE: Ellen McLain has had a long career as an opera singer. 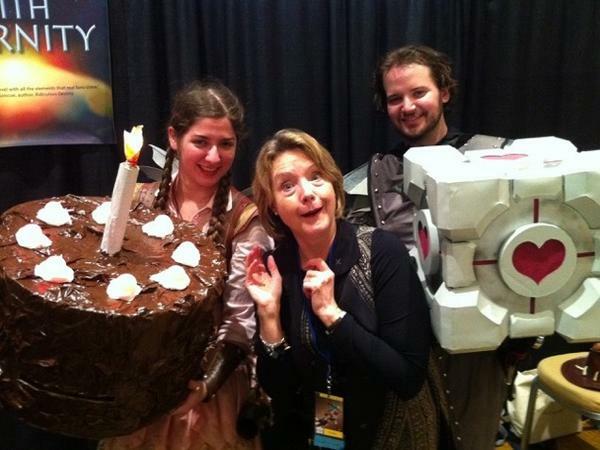 ELLEN MCLAIN: (Singing in foreign language). GROSS: But now this is what she's most famous for. MCLAIN: (As GLaDOS) Here's an interesting fact - you are not breathing real air. It's too expensive to pump this far down. GROSS: That is McLain doing the voice of GLaDOS. GLaDOS is the passive-aggressive computer in the games "Portal" and "Portal 2." Her husband, John Patrick Lowrie, began his career as a guitar composer. GROSS: But he's now famous for doing the voice of the snarky Australian sniper in the game "Team Fortress 2." LOWRIE: (As Sniper) ...Have a plan to kill everyone you meet. GROSS: These games are blockbusters. If you're 20 years old, there's a good chance you've played them. So this is a story of unlikely fame for a couple now in their early 60s. Two decades ago, Lowrie started to land video game roles. LOWRIE: The first video game I did was a thing called "Spyfox Breakfast Cereal." GROSS: Lowrie wasn't a snob about it. It was a gig. But in those days, the industry was not too sophisticated. Game developers would just hand him some lines with no direction. One time his line was simply, goodbye son. LOWRIE: And I said why am I saying goodbye to him? What's going on? They'd call up the writer and say OK, OK, so what's happening? This is a place where the game branches, and your son is either going to, you know, go down to the store and be right back, or he's going to step through this inter-dimensional gateway and go to another universe and you're never going to see him again. So could you say it in a way that would work either way? And I said goodbye son - great, that's great. That'll work fine. GROSS: Lowrie says developers got more savvy as the games became more cinematic. He urged his wife to audition, but McLain was reluctant. MCLAIN: I thought eh, you know, why should I do this? I'd never get work. Well, never say never. MCLAIN: (As GLaDOS) Initiating surprise in three, two, one. They told the actors who were auditioning to sound as much like the computer-generated voice as you possibly could. MCLAIN: (As GLaDOS) I feel awful about that surprise. Tell you what - let's give your parents a call right now. GROSS: In "Portal," GLaDOS the computer has you do puzzles and keeps promising cake. But by the end, you realize she's lying. LOWRIE: Twenty-four hours after the game was released, we got a fan email from Denmark saying people are in the streets of Copenhagen chanting the cake is a lie. The cake is a lie. And it's like, oh, my gosh, I'm married to a world-famous person now. GROSS: But Lowrie's famous, too, not just for the sniper, but also for Pudge the Butcher in the game "Dota 2." Podcasters from as far away as India do gushing interviews. UNIDENTIFIED HOST: Guys, welcome to the show where we talk to Pudge. LOWRIE: (As Pudge the Butcher) Oy, hello. You know what I like? I like fresh meat. UNIDENTIFIED HOST: Oh, my God. I've got goose bumps. If you can see here, I've got goose bumps. GROSS: Lowrie and McLain now have this link to a younger generation. Sometimes just for fun, they reveal their video game alter egos to random strangers. MCLAIN: I'll see, say, a 17-year-old boy walking down the street. And as I go by, I'll say (as GLaDOS) we're a lot alike, you and I. You tested me. I tested you. You killed me. I - oh, wait a minute, I guess I haven't killed you yet. Well, food for thought. And I totally blow their mind. GROSS: So how does it feel to have this be what you're famous for? MCLAIN: It's miraculous to me. GROSS: McLain and Lowrie say they never could've imagined this career. But they say it's gratifying to play the characters so many people around the world love - or love to hate. For NPR News, I'm Ashley Gross in Seattle. Transcript provided by NPR, Copyright NPR.